Newer users often get confused trying to compare Outlines with Maps. This is not entirely surprising as Tinderbox always starts a new document with a blank Outline. Users wanting maps then make a new Map view. Now they will have an Outline and a Map that sort of look the same (especially if there's no nesting of notes) but are not. This article attempts to answer some of the functional side of the similarities/differences of the two view types. Note: words in this article with a $ before them indicate reference to a TB attribute, e.g. $Name is the title of a note. Now, consider the outline and map views above, of the same TBX content. moving an item in the map: $Xpos & $Ypos change, but $OutlineOrder & $SiblingOrder are not affected. using bring forward or send back on a map item: $OutlineOrder & $SiblingOrder change (and the item moves in the outline) but $Xpos & $Ypos are unaffected. moving an item in the outline: $OutlineOrder & $SiblingOrder change but $Xpos & $Ypos are unaffected. 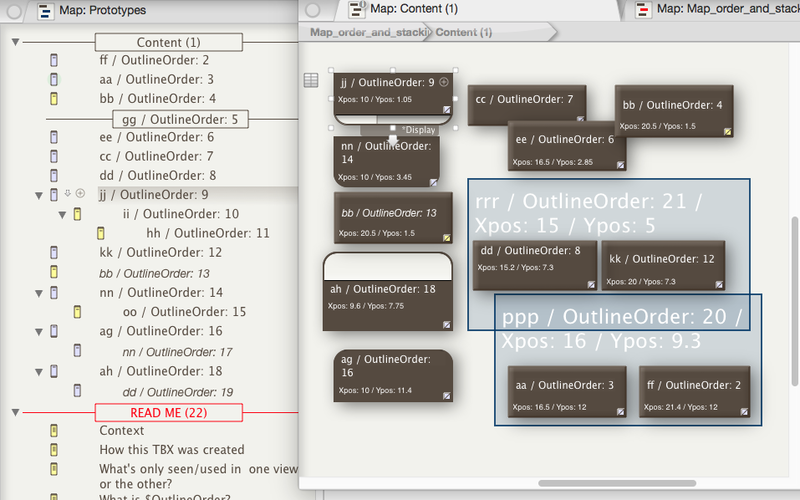 On the left is the outline view, on the right the map view. The notes all have a short two-l or three-letter $Name like 'bb', 'ag' or 'rrr' and the rest of the title you see is a $DisplayExpression enabling you to see the $OutlineOrder on screen. Names where the two letters are the same are notes/containers (including separators); two different letters denote an agent; three similar letters denotes an adornment. In addition, in the map, the $Xpos and $Ypos X/Y location co-ordinates are shown; in notes/containers this is by displaying body text ($Text) and for adornments - which have no (visible) $Text - the $DisplayExpression has been further amended. You will notice that you will need to set icons a bit wider than the default and on notes/containers drag the title section down a bit to see all the captioning. Notice too that a map view container icon's viewport map shows $DisplayExpression but note text is not drawn as in a normal icon - see the icon for container note 'ii' inside the viewport of container note 'jj' at left of the map.